Get the whole family talking at dinner with these fun Would You Rather Questions for Kids! Encourage them to use their imaginations, share their thoughts, and ask questions with this free printable! Family dinners have always been a huge part of my life. Pretty much every night when I was a kid, we’d all sit down for dinner together and talk about our days. Even when my brother and I would come home from college, we’d still all sit around the table and enjoy dinner together. And now as a little family of three, we eat dinner at the table every night. Although the past few years have mostly been spent negotiating how many more bites or explaining that a bowl of ice cream is not a healthy choice for dinner. But now that our little guy is more talkative about his day, I’m always looking for more ways to get him involved in the conversation that isn’t just asking him about what he did at school. 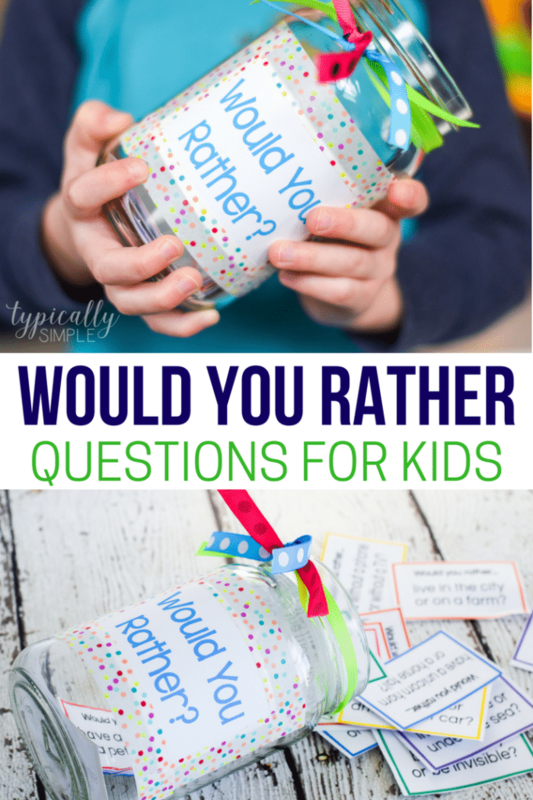 This would you rather for kids is a great way to get the kids chatting! 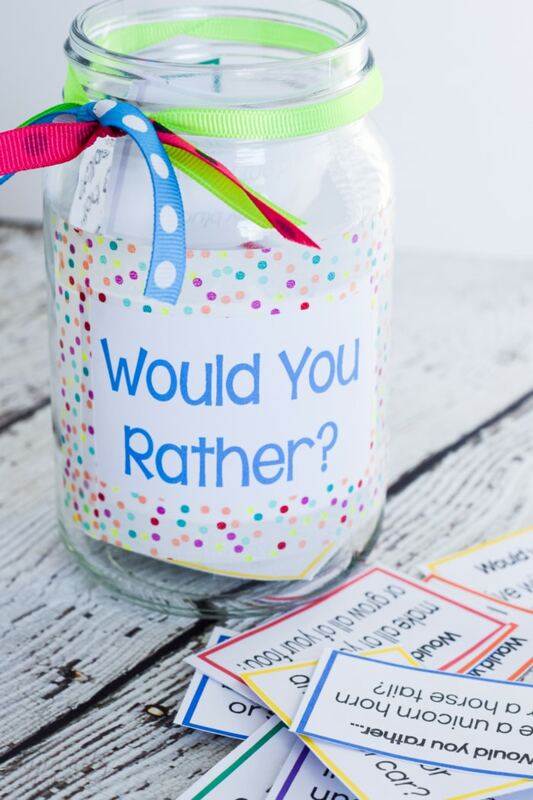 Plus it’s super easy to put together with the exclusive Would You Rather for Kids printable! 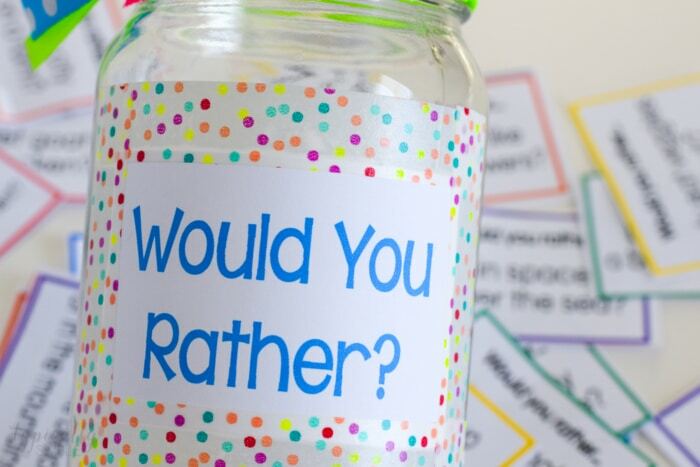 Print the Would You Rather printables. Cut out each rectangle with a question to create the cards. 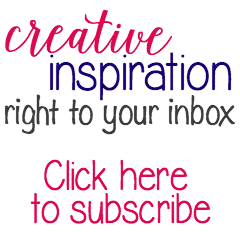 Decorate an empty jar using washi tape, ribbon, glitter glue, etc. Fill the jar with the question cards. Place on the dinner table and have everyone take turns pulling out a question to answer. Print on card stock or laminate to make the cards sturdier for little hands. 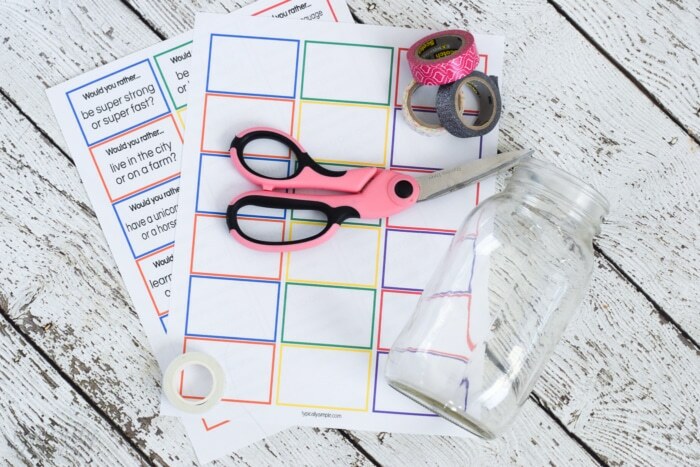 Hole punch the cards in one corner and use a binder ring to create questions on the go – perfect for car trips or while waiting at appointments. Ask the kids “why” after they give an answer to help them expand on their ideas. Use the blank cards to create your own questions together as a family! 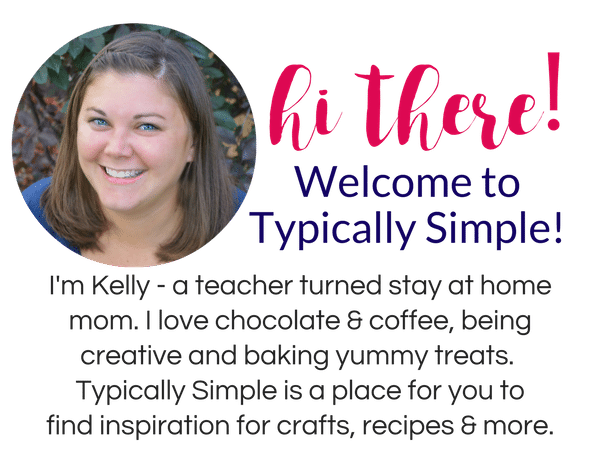 Would You Rather for kids is not only fun to play as a family, but also a great way for teachers to get their students talking and discussing their ideas in the classroom. Use the cards for classroom icebreakers, writing prompts, or just a fun 5 minute brain break activity! 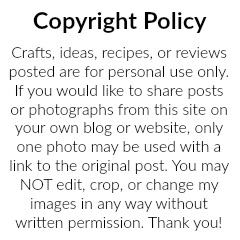 Looking for more printable activities and ideas?